New Delhi: Mizoram is one of India's fastest-growing, healthiest (second) and most-literate (third) states. The state has been ruled by the Congress or the Mizo National Front (MNF), ever since the peace accord of 1986. That agreement ended the long-running Mizo uprising, marked by air raids on capital Aizawl in March 1966, the only time the Indian Air Force bombed its own people. In the 2013 elections in Mizoram, the party won 34 of 40 seats. But since 2014, the Congress' vote share declined 13.4 percentage points across the northeast. Led by Lal Thanhawla, former insurgent-turned-mainstream politician, the Congress has administered Mizoram for the last 10 years. After the victory of the BJP-led Northeast Democratic Alliance (NEDA) in Meghalaya, Nagaland and Tripura earlier in 2018, BJP is hopeful in making inroads into the state. While 2,55,917 voters (44.63%) across constituencies voted for the Congress in 2013, the MNF got 1,64,305 votes (28.65%) overall. In 2008, the margin was even smaller — the Congress had captured a total of 1,95,614 (38.89%) votes, while the MNF had secured a total of 1,54,132 votes (30.65%). Mizoram recorded a turnout of 82.35 percent in the 2008 elections, which rose to 83.41% in 2013. 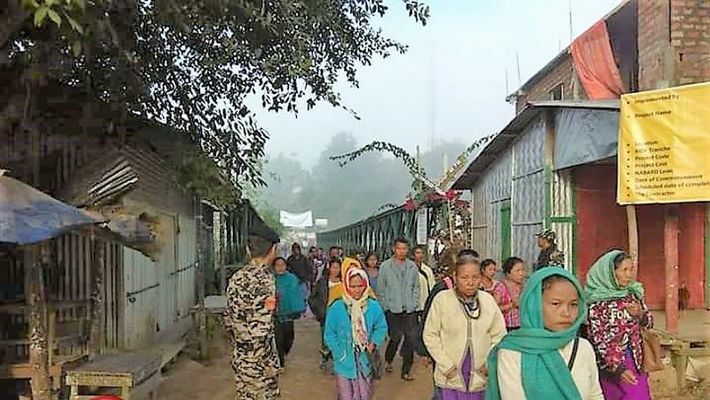 More than 94% of Mizoram is tribal, 80% is Christian, and minorities -- the Chakmas and Brus -- claim racial discrimination at the hands of majority communities, such as the Lusei, Ralte, Hmar, Khiangte and Lai. Mizoram had all 40 legislators are men. Of the six women who contested the 2013 elections, only one was from the Congress. In 2018, 4.8% more women electors are set to vote. MNF's Lalrinenga Sailo contesting from Hachhek in Mamit district is the richest candidate with assets in excess of Rs. 100 crore. Of 209 candidates analysed, 9 (4%) candidates have declared criminal cases against themselves. In 2013 Mizoram Assembly Elections, out of 142 candidates analysed, 3(2%) had declared criminal cases against themselves. Many exit polls have predicted that the Congress is on the verge of losing its last remaining government in the Northeast, hinting at a coalition government where BJP can play a defining role.